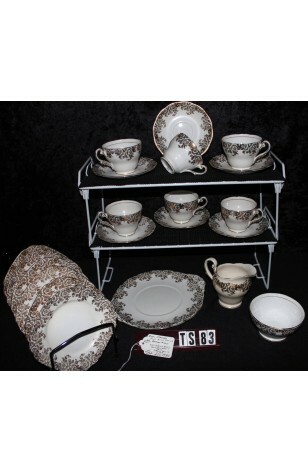 Vintage - Royal Standard Fine Bone China Tea Set, 21-Piece, Service for (6) Six, Pattern #762, Circa 1949. A Stunning White China Tea Set, Service for (6) Six. Embellished with 22kt Gold Gilt Roses and Foliage. Our research leads us to believe this is a Royal Standard Fine Bone China, Pattern #762. The 22kt Gold Pattern is on the Rim of the Plates, Outside of Cups and Creamer. Pieces are Trimmed in 22kt Gold on Rims, Handles, and Feet of Cups. A Stunning White China Tea Set, Service for (6) Six. Embellished with 22kt Gold Gilt Roses and Foliage. Our research leads us to believe this is a Royal Standard Fine Bone China, Pattern #762. The 22kt Gold Pattern is on the Rim of the Plates, Outside of Cups and Creamer. Pieces are Trimmed in 22kt Gold on Rims, Handles, and Feet of Cups. In Great Resale Condition unless noted below or in pictures.